← 262 "New Kids on the Blecch"
The Simpsons are black belts in karate. They use their hands to chop up the couch while Homer does an elaborate flip and switches on the TV with his remote. "“Temptation Island” was not a sleazy piece of crap"
"Hungry, Hungry Homer" is the fifteenth episode of season 12. It originally aired on March 4, 2001. The episode was written by John Swartzwelder and directed by Nancy Kruse. Stacy Keach guest stars as Howard K. Duff VIII. "After Homer discovers that the Springfield Isotopes are being moved to Albuquerque, he stages a hunger strike outside the stadium." The Simpsons visit Blockoland. Lisa buys an Eiffel Tower kit, only to find out later that it has a deliberately missing base piece. Homer decides to "sticks up for the little guy", getting Lisa the piece from a box labeled 'Missing tower pieces'. He then goes on to help Bart get a date for the upcoming school dance (by telling Sherri she couldn't do better), and helps Marge's hair stylist sort his finances, getting her two free hair streaks in return. One day while at the ball game, the Springfield Isotopes are losing. Homer goes to get Lenny's ticket refunded, and meets the Isotopes' owner, Howard K. Duff VIII. The man refuses to supply a refund, but in his haste to leave, Homer discovers evidence that the Isotopes are being moved to Albuquerque. Duff insists that they are not moving, and quickly has Duffman drug Homer to cover up the truth. Homer attempts to alert the local media of the scheme, but they call him a liar after he fails to provide evidence - Duff had removed all traces of it before it could be retrieved. 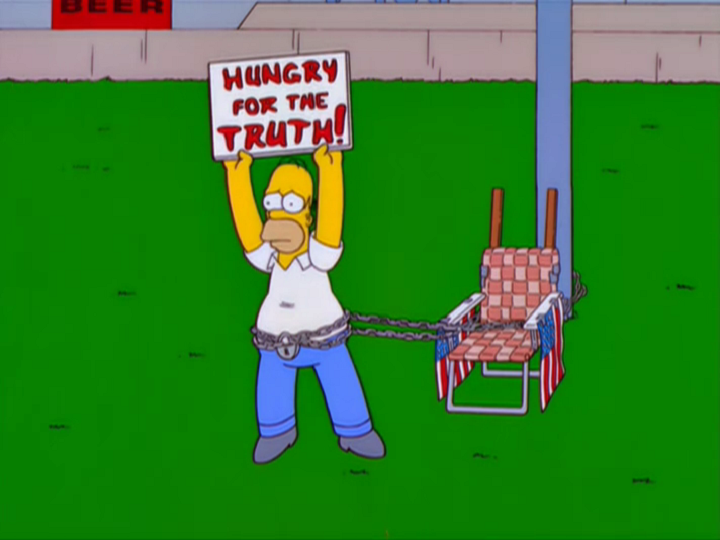 Homer goes on hunger strike in response, chaining himself to a pole near Duff Stadium, hoping to force the owners of the team to admit their secret plan. He draws quite a crowd, so the Isotopes management decide to relocate him to inside the ballpark, next to the field. They then exploit his popularity, calling him "Hungry, Hungry Homer". Meanwhile, back at home Bart, Lisa, and Maggie have all gotten fat, as lately they have had to eat Homer's dinner along with their own. Lisa asks her mom why she doesn't just cook less, to which Marge states "I don't do things that way Lisa". Eventually Homer becomes so thin and ill that the team decides to get rid of him; they plan on putting a man who drinks a bucket of paint in his place, but the man falls down twitching while doing his trick. In a public ceremony, the team's owner unchains Homer, offering him a free hot dog. Homer realizes that the hot dog is topped with Southwestern ingredients. He reveals this new evidence to the witnessing crowd, who also notice that the hot dogs are wrapped with "Albuquerque Isotopes" paper. The crowd gets angry: Howard K. Duff VIII tries to bluff his way out of it, but even Duffman turns against him. The fans hail Homer as a hero for exposing the lies, and they shower him with food (which he gladly eats as they throw it). Over in Albuquerque, his plan to 'steal' the Isotopes ruined, the Mayor of Albuquerque decides to purchase the Dallas Cowboys]. When he's told that they're a football] team, he retorts that they'll play what he tells them to, as he menacingly declares, "for I am the Mayor of Albuquerque!" The last scene with the mayor of Albuquerque hatching a new plan was cut in syndication, so the episode ends with Homer celebrating in the stadium. The original ending is still shown in Sweden, Denmark, Britain, Canada, Australia, New Zealand, France and Hungary. A real-life minor-league baseball team, based in Albuquerque, decided to name their team the Albuquerque Isotopes after this episode. This episode also popularized the internet slang word "meh". Modified on March 28, 2019, at 13:33.